I have been wearing the same pair of running shoes for over three years. I bought them with the Christmas bonus my boss gave me and I remember picking the perfect pair was quite the process. They have definitely been great shoes but I have needed new ones since, oh, probably last year. My feet always got sore when I wore them. There was hardly any support or padding left. So, when it got time to make my Christmas "wish list" for Blake, new running shoes were on the top. I went to Finish Line's website and randomly picked a few pairs out that I liked. I knew I wanted them to be pink but other then that, I left it up to Blake. On Christmas morning I was more than pleased to open up my new shoes. They were pink but they were also Nike Shox. 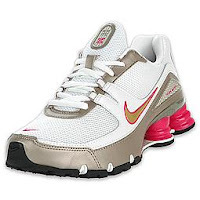 I had heard good things about these new (well, sort of new) Shox but I always told myself I would never get them. What was with the weird columns in the back? Were they really necessary? I was sure they wouldn't make any difference in the performance of the shoe. I was convinced that they were only an expensive gimmick. Boy was I eating my words the first day I laced them up and began running on my treadmill. Not only were they lighter than my previous pair, they fit my foot like a glove. I felt like I was running on clouds. I am not exaggerating at all when I say that I was able to run a full five minutes longer with these babies on my feet. These shoes have changed the way I work out. The pink plastic cylinders in the back are even starting to grow on me. In fact, I dare say that I like the way they look now. Now if I would just stop making chocolate chip cookies, I might be able to see some results of all this running that I am doing! I think your new shoes are super cute! I used to blame not working out on my shoes. I finally got a new pair and then a month later got pregnant and now I have a new excuse. P.S. I like the title of this post! GREAT SONG! I'm sold. I need some new ones anyway. Do you still have a coupon?